Chinese navigation satellite. Operational, first launch 2000.10.30. Beidou ('Big Dipper') was the satellite component of an independent Chinese satellite navigation and positioning system. Status: Operational 2000. Gross mass: 2,200 kg (4,800 lb). Unfuelled mass: 1,100 kg (2,400 lb). The initial Beidou-1 test system of 2000-2010 consisted of two geosynchronous satellites and one spare, which provided service to tens of thousands of users in the Chinese military and government. 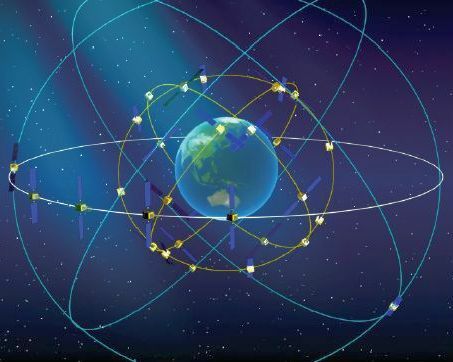 Beidou-2, consisting of five geosynchronous satellites, three inclined geosynchronous orbit satellites, and 27 medium earth orbit satellites, was deployed 2010-2020. This provided a 10-m-accuracy public and precision military navigation service to east Asia by 2012, with global service by 2020. The end result: a Chinese indigenous satellite navigation and positioning system and industry. Beidou began in 1983 with a proposal by Chen Fangyun to develop a Twinsat regional navigation system using two geostationary satellites. The concept was proven in 1989 in a test using two in-orbit DFH-2/2A communications satellites. This test showed that the precision of the Twinsat system would be comparable to the American Global Positioning System. In 1993, the Beidou program was officially started. Beidou used the DFH-3 bus and had similar basic performance. Experimental launch of the first two indigenous geosynchronous Beidou navigation satellites was in 2000. A third test satellite was launched in 2003. This demonstration system provided basic services to the Chinese government and military including positioning, timing and short message communication within the East Asian landmass. The initial two satellite system was based on an iterative determination of a user's altitude. Each of the satellites continuously broadcast signals to all parts of the Earth that were visible to it (the entire Asian landmass). A user's station excerpted a certain portion of those signals and transmitted it back to the satellite. The satellite, in turn, forwarded the received signal to the system's control center. Computers at the system's control center then determined the distance between the user and the satellite by inferring the time-of-flight difference between satellite and user from the time the signal was originally broadcast, which was stamped with the broadcast time, and when the relayed user's signal reached the control center. The control center then combined an initial guess of the user's altitude (and hence the distance from the Earth's center), either from the last reported altitude or perhaps by using an arbitrary guess such as sea level, with the distances from the two satellites to get three distance estimates for the user's position. This determined the first estimate of the user's latitude and longitude. A map of the user's region (presumably stored digitally) was then used to make an improved estimate of the user's altitude, which could then be fed back into the latitude and longitude calculation to make an improved estimate of those quantities. Although such a system could achieve GPS-like accuracies (except in steep terrain), it obviously had serious operational constraints. The user had to emit in order to achieve a location fix. And the control center provided a single point target that would bring the entire system down. However it was a way to obtain, in only two satellite launches, an indigenous, independent, high-accuracy military navigation system that would function in anything less than total war with a major power. Beidou also had an active communications capability, allowing the leadership to send secure orders and receive confirmations and status reports. The US Department of Defense estimated that the initial Beidou system had an accuracy of 20 meters over China and surrounding areas. The initial terminals cost $ 3,000; this had been brought down to $ 400 by 2009. By 2009 over 50,000 terminals were in use by the Chinese military, border guards, and government agencies. Vehicle-, ship-, container-, and handheld terminals had been produced. A private company, BDStar Navigation, was formed to develop the Beidou ground segment and to market receivers to commercial operators. The company had originated as a joint venture with Canada Novatel in October 2000 to develop and market GPS receivers. A year later the draft project for the Beidou 1 Information Service System was completed, which provided the basis for open applications of the Beidou navigation system. A joint state-industrial committee approved the final project plan in January 2003. Funding from the Ministry of Science and Technology led to work beginning on a Beidou Satellite Integrated Information Application Service as part of the Chinese National 863 Development Plan. The system passed acceptance testing in December 2005, leading to potential application of Beidou receivers for Chinese ocean fishery vessels. In June 2006 the commercial demonstration project for a Beidou Ocean Fishery Secure Production and Transaction Information Service was started. The first Beidou-1, launched in October 2000, was no longer in use by 2010; and those launched in February 2007 and April 2009 experienced control failures and were unusable. Given the operational constraints of the geostationary Beidou system, it was perhaps unsurprising when China announced a new concept for Beidou in 2006. These satellites would use the same navigation principle as Navstar, GLONASS, and Galileo, with internal high precision clocks and orbital information beaming the precise position information of the satellites to the passive receivers of users. Combining signals from multiple satellites allowed the user receiver to calculate its position on earth with high precision. Meetings between China and the International Telecommunications Union, the USA, Russia, and the EU in 2007-2009 established the compatibility and interoperability of Beidou-2 signals with those of other nations. Beidou-2 would operate in three frequency ranges: 1559.052-1591.788MHz; 1166.22-1217.37MHz; and 1250.618-1286.423MHz. 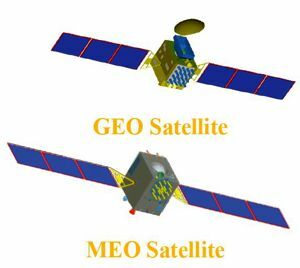 Five GEO (geosynchronous orbit) satellites, also incorporating the Beidou-1 location and messaging technology for backward compatibility with existing receivers. Five of these were operational as of the end of 2010: the two experimental satellites launched in December 2000 and May 2003; and the operational satellites launched in January, June, and November 2010. The first Beidou, launched in October 2000, was no longer in use; and those launched in February 2007 and April 2009 experienced control failures and were unusable. Presumably two further launches would be made by 2012 to replace the older satellites and the two failed launches. Three IGSO (inclined geosynchronous orbit) deployed in three planes, in 24-hour orbits at 38,300 km altitude but inclined at 55 degrees to the equator. The orbits were such that one satellite would be over Chinese territory at all times, providing an overhead signal allowing navigation even when surrounded by tall buildings or rugged terrain. These were launched in July and December 2010, and April 2011. 27 MEO (medium-earth orbit satellites), deployed in three planes, in 21,500 km altitude orbits inclined at 55 degrees to the equator. The first test satellite was launched in April 2011. Four were to be deployed by 2012 to provide the first regional coverage for the system, and all 27 by 2020, to provide global coverage. China intended to market Beidou receivers in competition with GPS, Glonass, and Galileo. Two levels of service were to be provided. The public service for civilian use would be free to all users with a Beidou receiver and would have a 10 meter location accuracy, provide clock synchronization signals with an accuracy of 20 ns, and measure speeds within 0.2 m/s. The licensed military service would be more accurate than the free service, also provide system status information, and a military communications capability. Total Beidou users in China were expected to total 900 million by 2025 with annual sales of related applications and services of $80 billion. Family: Geosynchronous orbit, Navigation. Country: China. Launch Vehicles: Chang Zheng 3A, Chang Zheng 3C. Launch Sites: Xichang, Xichang LC2. Bibliography: 2, 4, 424, 4479, 530, 552, 554. Differences between the MEO and GEO versions of Beidou. Position of the inclined geostationary satellites of the Beidou system at a particular moment of time on their ground trace.